Don't miss the ranch related posts on our sister branches. Sacred Earth Vision Quest Ranch and Sacred Earth Gardens both have posts up on using hemp bedding for horses and chickens respectively. Going green on the ranch is getting easier every day. One of the most indispensable pieces of equipment on many ranches is the ATV. Now you can go green with a GEM eM1400 electric ATV. These units can be configured in a variety of ways to handle many hauling requirements. They can accommodate a payload of 1,400 pounds with a 7hp motor. The price range is very reasonable, too, with models beginning at $9,999. With the great offroad experience of Polaris behind the eM1400, we think it is a must for anyone who uses an ATV. Take a look for yourself, and enjoy the quiet and Peace of mind that going green can bring. You can find out more about GEM electric vehicles here. We have a Health Alert up on the Healing Arts Center blog. If you have horses, dogs, or other pets or livestock drinking fluoridated water, you need to take a look at this alert and the video with it! You can link to it here. If this alert is not the latest entry on the blog, you can scroll down the blogs to find it or search the "Health Alerts" tag for it. We have created a new section in the Leyendas de Andalucia branch of the Foundation. It is called "Articles and Other Thoughts". Our first article is entitled "Making Choices for Your Horse - Transferring Ownership". This article covers some of the issues that we have identified and worked with in some of our equine clients through the Healing Arts Center. Please take a look at this article, particularly if you breed, buy, sell, or trade Andalusians or Lusitanos. These are incredibly sensitive horses with special care requirements. Click on the link above to connect with it. You couldn't ask for a better partner in grounding and connecting with Mother Earth than a horse, especially if that horse is an Andalusian. They can serve as a beautiful bridge for finding our Earth roots. Special Thanks to Ambrosia Design! Special thanks to Ambrosia Design for the use of the spectacular Andalusian horse photographs currently in use on our site. 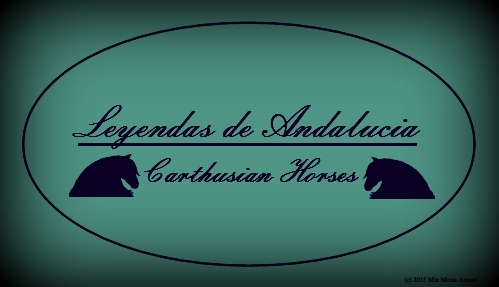 Welcome to Leyendas de Andalucia - home of some of the finest Carthusian horses in the world! Please note: All blog material posted by Leyendas de Andalucia is copyrighted by The New Gaea Foundation.